Fulk IV, called le Réchin, was the Count of Anjou from 1068 until his death. The nickname has no certain translation. Philologists have made numerous very different suggestions, including "quarreler", "rude", "sullen", "surly" and "heroic". He was noted to be "a man with many reprehensible, even scandalous, habits" by Orderic Vitalis. 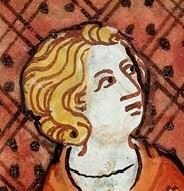 When Geoffrey Martel died without direct heirs he left Anjou to his nephew Geoffrey III of Anjou, Fulk le Réchin's older brother. Fulk fought with his brother, whose rule was deemed incompetent, and captured him in 1067. Under pressure from the Church he released Geoffrey. The two brothers soon fell to fighting again, and the next year Geoffrey was again imprisoned by Fulk, this time for good. In 1096 Fulk wrote an incomplete history of Anjou and its rulers titled Fragmentum historiae Andegavensis or "History of Anjou." The authorship and authenticity of this work is disputed. Only the first part of the history, describing Fulk's ancestry, is extant. He died in 1109.